I didn’t grow up by the sea, so every time I’m faced with an ocean, I get a true sense of awe. The sheer magnitude of the thing in front of me leaves me speechless. I look out and it’s just water, as far as the eye can see. On a clear day, the horizon for an average person standing by the sea is about 5 kilometres. So if looking out 5 kilometres in every direction is enough to impress me (and I’m pretty sure I’m not the only one), you can imagine why I love looking through telescopes so much. The moon, an easy target for amateur astronomers like myself, is nearly a hundred thousand times further away than that horizon (384000 kilometres on average). When you look at it through a telescope, you can see start to identify craters and “seas”, just like Galileo did 400 years ago. And that’s the closest non-Earthly object in the Universe. It only gets further from there. Light, travelling at the speed limit of the universe, takes about one second to reach us from the Moon. The Sun, which by coincidence is the same apparent size as the moon when viewed from Earth, is 400 times further away. Light takes 8 minutes to reach us from its tumultuous, fusion-fuelled surface. It takes light 4 hours to get from the Sun to Neptune, the edge of the Solar System (sorry Pluto, you don’t count anymore). Light travelling for 4 years will just about get to the nearest star (Proxima Centauri) and to get to the edge of the Milky Way from its centre takes light more than a thousand human generations (50000 years +). While those distances are starting to get mind-boggling, the Milky Way is only one very tiny part of the Universe. Sure, it contains a billion stars and the only known way that the Universe knows itself, but we’re learning that we’re even smaller than we thought. The next closest galaxy to the Milky Way is called Andromeda, and together with 52 other mini-galaxies, we live in the Local Group. The Local Group, in turn, is part of a supercluster of galaxies called Virgo. And that was it – our Universal address was Earth, Solar System, Milky Way, Local Group, Virgo Supercluster. But in 2014, astronomers redrew the map of the local Universe by looking at where galaxies were moving. It turns out that we’re part of a much larger supercluster called Laniakea. The name is apt, meaning ‘immeasurable heaven’ in Hawaiian. Another recent discovery has shed new light on the size of the universe. In October 2016, astronomers from the University of Nottingham and the University of Edinburgh used data from a new set of Hubble images called Frontier Fields to recount the number of galaxies in the Universe. The original Hubble Deep Field images, released in 1996, reached further away (and therefore further back in time) than anything previously available. They glimpsed 12-billion-year-old galaxies from the very early Universe. 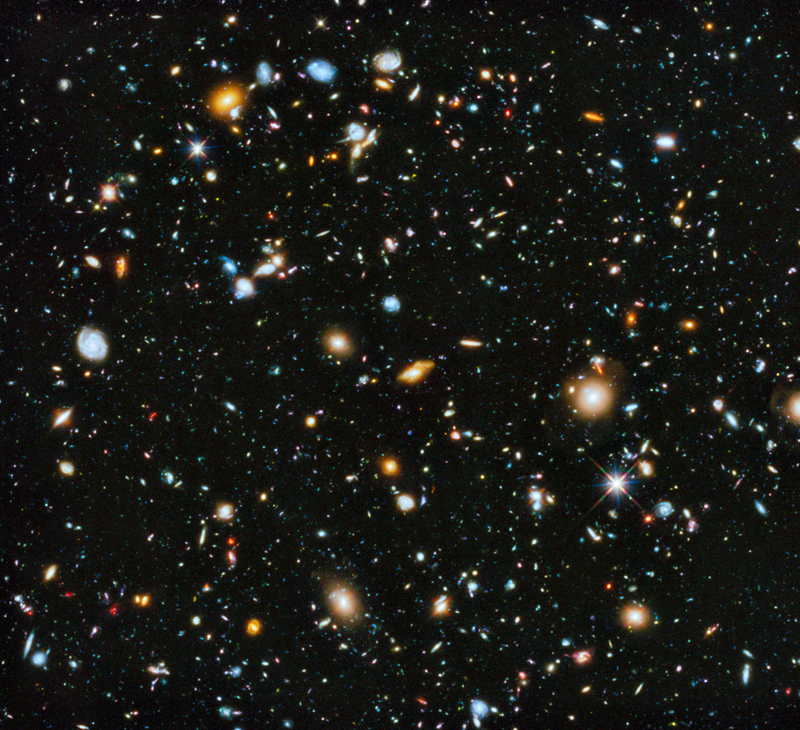 These Deep Field images had thousands of galaxies in them, so when astronomers extrapolated that out to the whole sky, 120 billion was the agreed number of galaxies in the Universe. But 120 billion galaxies don’t weigh enough, so astronomers suspected that might be a miscount. This new study uses images that go back 13 billion years and used a mass distribution approach to arrive at a new number that would include galaxies too faint to actually observe. Their results show that there are 2 trillion galaxies in the Universe, 10 times more than previous thought. Or, at least, there were 2 trillion galaxies. Many of the small, early galaxies will have merged with others in the intervening 13 billion years, but the light from those mergers hasn’t reached up yet. With astronomers not only redrawing the map but also doing another census, it turns out space was bigger and fuller than we thought.